The negotiations began with discussions over changing Denver’s pay system to more closely resemble other districts that allow teachers to advance in pay based on experience, education and training. Both sides met publicly and in private to discuss proposals. The walkout came about a year after West Virginia teachers launched the national “Red4Ed” movement with a nine-day strike in which they won 5 percent pay raises. Most recently, Los Angeles teachers held a six-day strike last month. The dispute is over the school district’s incentive-based pay system. 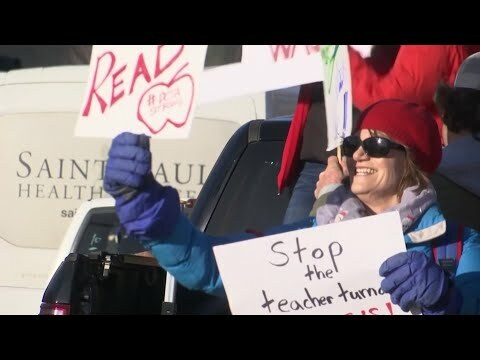 The district gives bonuses ranging from $1,500 to $3,000 a year to teachers who work in schools with students from low-income families, in schools that are designated high priority or in positions that are considered hard to staff, such as special education or speech language pathology. “It’s what’s right. It’s not ideal. I don’t want to be out here,” she said on a picket line outside the school Monday.